In this next section, we would like to invite you to the part of the Toolkit in which we have included ‘Individual Exercises’ which aim to encourage a self-critical, questioning and curious attitude. Intercultural learning can challenge one’s identity and everyday ways of thinking. As has been stated previously, learning interculturality means to become firstly aware of oneself, as only then you will be able and ready to learn about new cultures and the lives of other people. Download the exercises in .pfd, print them and perform the activities. Please take some time to work on the self-directed, learning activities suggested by the PAPYRUS project team, which focus upon reflection and reflexivity. The multicultural journey which we are inviting you on will result in deepened knowledge of culture and growth of cultural sensitivity and serve as departure point for further study on this area. Where are your colleagues from and when have you experienced cultural differences between you? Think about a work setting in which you have worked with different people from a range of backgrounds. These differing backgrounds may have been about nationality but also about social class difference, regional difference (from within the same country) or about other features, such as gender, ethnicity or religion. How did cultural differences and differing ways of doing things according to culture or other features, become visible in your workplace? List some of these. Comment: You may have identified a host of ways in which cultural and other social differences have entered into your work experiences with those around you. It is also likely that you will have had numerous examples to choose from your life experiences. However, let us think about a few differences that might be identified thorough one of the PAPYRUS Consortium team members doing this activity. In working in social services, one member of the Consortium had experiences of being in diverse teams with a wide range of staff group cultural differences. Even different notions of politeness, how to address others can differ and can cause conflict where people do not recognize that such features of behaviour often are about cultural difference. In the United Kingdom it is commonplace in majority culture to knock on a door before entering an office and for people to engage in ‘chit chat’ or small talk before getting down to business. However, not everyone does that, in some areas of the UK people are more likely to talk about all kinds of personal matters, to joke more or to ask personal questions. Even within cultures, issues of similarity and difference arise between people. We do generally accommodate differences between ourselves and others and we make ‘allowances’ but cultural differences exist even in our day to day work and interactions with colleagues, service users and so forth. Our ‘Cultural Glasses’, our opinions, perception of others and of the world are often based primarily on our past experiences. Think how much of what you know about the world and people is learned through your own personal experiences. We all tend to make judgments and generalise, as a matter of course; it is almost as if we are constantly wearing ‘cultural glasses’ through which we see the world. However, because our personal experiences differ, in a similar way the ‘cultural glasses’ of people are not the same. In order to be able to understand others, respect their perspectives and the way how they perceive the world firstly, you need to know yourself and be aware of your identity and cultural background. This is why we would like you to take some time and think about this and what are the aspects of your personal position and perspective. What elements of your identity and your past experiences shape your ‘cultural glasses’? 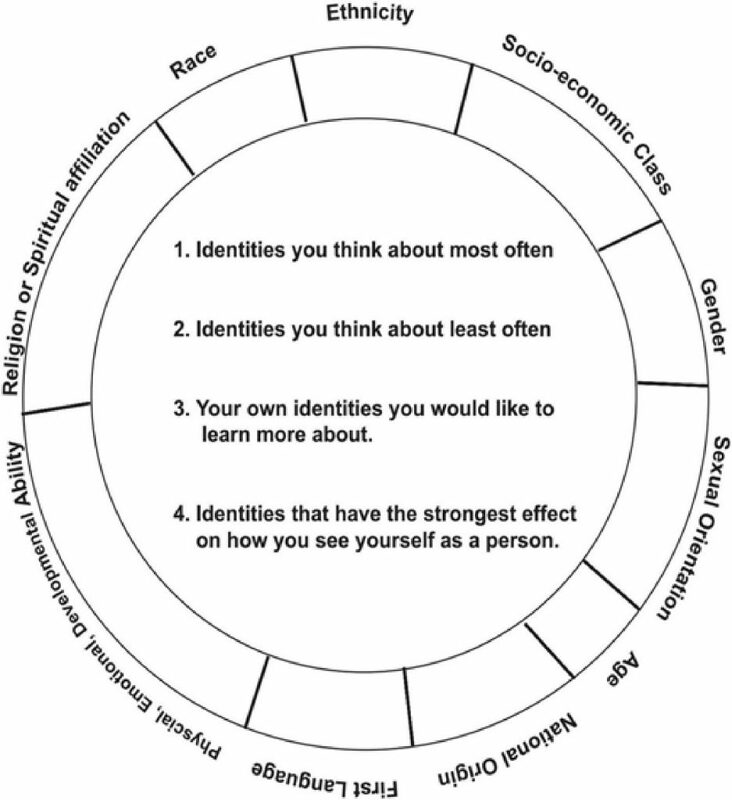 Identity Wheel This activity will allow you to self-reflect and think about your identity and the aspects of life that matter to you the most. We would like to acquaint you with a very useful tool for the personal reflection known as the ‘Identity Wheel’. Please complete the wheel by labelling each segment of the wheel using the scale shown below. You may wish to label one segment with more than one number (adapted from Runell (2010); many versions of the identity wheel can be found online). Which identities where you more aware of? Which identities do you take for granted and not think about often? Can you identify any identities which you need to work on being more aware of? Is there anything else you would like to add to the ‘Identity Wheel’ that would help describe you? Cultural competence is not about ignoring differences between people but understanding something of how culture might change how people do particular things, how they express ideas and say things and what they may consider to be acceptable or unacceptable. The culturally competent practitioner is able to recognize when culture is shaping how people act, speak and behave and work easily in and between different cultural norms to help people from a host of backgrounds. Refugees arrive from many different countries and they bring diverse backgrounds and experiences, possess variety of strengths, and encounter myriad challenges as they adjust to their new lives in new countries. When you are working with refugees and asylum seekers it is really important to invest time and energy in learning more about their backgrounds, interests, aspirations and needs. Only by respecting and understanding their values, beliefs, and past, present and future circumstances you can build on their strengths (Abrams 2014: 18). 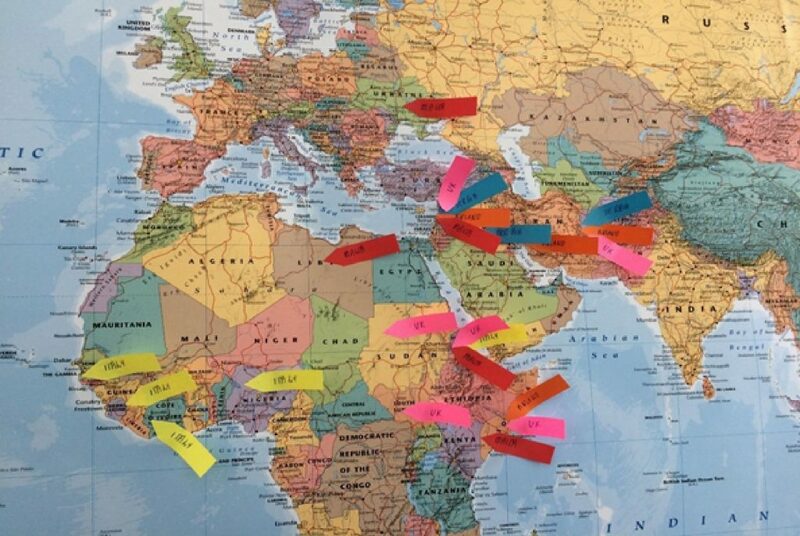 Mapping Cultural Orientation By learning about the refugees and asylum seekers you, as a Youth Worker, will be able to understand them and tailor support to their needs and perspectives. Think about young refugees and asylum seekers you work with and ask yourself this question: How much do you know about them, their cultural backgrounds and countries they came from? The above map presents the results of the ‘mapping exercise’ conducted by the PAPYRUS project partners in which project partners identified from which countries in the main do refugees migrate to Europe. Key: Blue tags – migration to Serbia, Yellow tags – migration to Italy, Red tags – migration to Malta, Orange tags – migration to Finland, Pink tags – migration to UK Look at the above map carefully. PAPYRUS Project partners gathered information about the refugee situation in their own countries. As a part of this ‘mapping’ exercise we wanted to identify from which counties in the main do refugees migrate to Europe. If you look at the photograph above, it is clear that there is diversity in the countries of origin of the refugees who migrate and that there are various countries involved in the process (and the above map only includes information from the project partners so as you can image the ‘real picture’ is far more complex). In the previous sections of this toolkit we have asked you to think what are your core beliefs and how they have been culturally influenced. Now, we would like you to stop and think about the young people you work with and ask yourself once again this vital question: how much do you know about the refugees cultural backgrounds? And are those backgrounds the same if people happen to come from the same country of origin? Individuals can demonstrate a wide range of values and preferences across a variety of cultural dimensions: communication patterns, space perception, time perception, gender views and beliefs etc. To help you in this activity we are going to guide you through it by asking some questions which will prompt reflecting on this matter. Do you believe in fate or are people rulers of their own destiny? Is it better to keep emotions private or is it better to express emotions openly? Do you prefer to address differences when there is an issue so the problem can be solved quickly or do you prefer to deal with differences indirectly, behind the scenes? Do you like to be on time and expect it from the others or do you believe that what happens is more important than when it starts and ends? Do you think that people should be treated the same, no matter what their position is or people should be treated differently depending on their title, rank, position? Is it more important for the group or the individual to be satisfied? Should the focus be on the relationships or the plan of action? Do you work because you want to or because you need to? Is it ok to talk to everyone in the same way or do you need to consider various factors like their age, gender etc. when communicating? By answering all of the above questions you should be able to better understand how your own culture influences your attitudes and behaviour. We would like to invite you now to think how is your cultural orientation map similar or different from refugees you work with? Would they answer the above questions in a similar way or not? If there are any differences could they potentially cause some disagreement or even conflict? Why, why not? Refugees and Youth Workers: Skills, Knolwedge and Qualities Every occupation demands from the professionals performing it to possess particular knowledge, skills/abilities and personal qualities. As a youth worker supporting and working with youth refugees it may be expected from you to have some very specialized knowledge, skills and attitudes such as: knowledge about the local programs, understanding of the challenges faced by refugees and asylum seekers, ability to liaise with various agencies, respect for people from different places, valuing diversity etc. Think about yourself and your colleagues (you may actually invite them to do this task with you) and list the examples of knowledge, skills and attitudes which you possess. You may wish to use the chart provided below. The above photographs present knowledge, skills and attitudes possessed by the youth workers and refugees which were identified by the PAPYRUS Team during our first project meeting When you (and your colleagues) were thinking about and listing the knowledge, skills and attitudes possessed by yourselves as the youth workers have you thought about the refugees you know and work with and have considered what knowledge, skills, qualities and talents they have? Would you be able to list those in a similar way as you have listed your knowledge, skills and attitudes?